This is where we go to church. A small congregation in Sun City West, AZ, a 55+ community. The site had been built and maintained faithfully by church members over the years, and the site we began with in 2018 was a big improvement on the one which we saw as new attendees some 18 months earlier. However, as is often the case, dedicated volunteers are normally no match for a team which does a job for a living. We added a new sermon repository & interface which cut a whole step out of the process of adding new sermons to the website. It also gave visitors the ability to easily search and play sermons on the site. We reorganized the navigation and made important information - like that a church visitor would want to know - readily available and obvious. 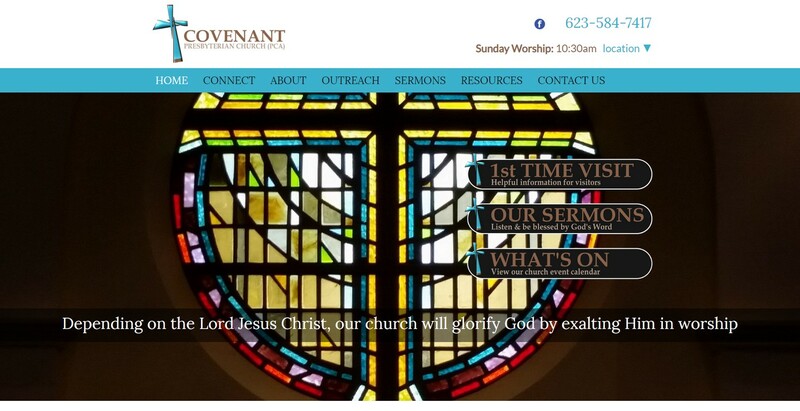 The church didn't have a logo when we took over the site. As we suggest to all clients, a logo is a big part of branding and gives identity to the business or organization. We designed the logo around the cross - obviously a huge part of the Christian faith - with the name of the church and the denomination. Rather than a traditional look for the cross, we opted for something a little more modern and trendy.